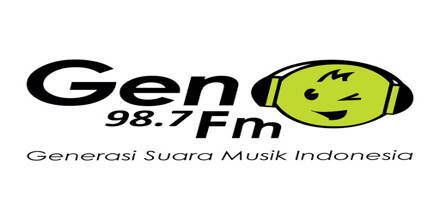 Gen FM, the glowing star of Indonesia’s online radio realm continuously entertaining their listeners across Indonesia. No matter whether you are in Indonesia or elsewhere in the world as long as connected to the internet you can have access to Gen 98.7. As a highly acclaimed radio directory, it’s natural that live online radio has got all the popular Indonesian radios listed along with Gen 98.7 FM. Trending latest music based playlists makes the playlists of Gen FM a notch more interesting than the rest. The energy they put in their presentation and the friendly approach of their RJ’s makes the radio a great entertaining package. In today’s age only playing good songs are not enough to be loved by fans it also needs to be connected with them in a friendly manner. The folks at Gen FM does so in a very friendly manner. They are connected with their listeners through their presentation and social platforms, which makes it easier for them to understand the listening behavior of their listeners. All the RJ’s of the radio are very friendly and energetic, just like the rest of the broadcasting team. First, Gene Surabaya 103.1 FM was named as Camar FM. Which was then purchased by Gen Jakarta 98.7FM and became 103.1 FM. It continued its test transmission and then launched as a full-fledged radio station on 1st March 2010. Although they changed their company’s air name to 103.1 FM Genes Surabaya, the name of the company remained the same as PT Radio Camar. Later on 103.1 FM Surabaya decided to change the name of the radio to Gen 103.1 FM On 1 March, 2017. Availability- Jakarta and Surabaya. Worldwide as an Online radio. Already interested to tune in to Gen FM?